Successful presidents do not need to come through the political process, but whatever their background, they need to be able to lead intelligently and to make sense of and mould the coalitions of interest—both domestic and international—that provide the opportunity to ensure the implementation of policy. One of the most impressive non-politician presidents was Dwight Eisenhower, the Republican president elected in 1952 and re-elected in 1956. A self-styled moderate conservative, Eisenhower provided an effective hard-edged moderation. Eisenhower benefited from, and helped to mould, the conservative ethos of the 1950s. His re-election in 1956 with a margin of nine million votes displayed widespread satisfaction with the economic boom and social conservatism of those years. There was an upsurge in religiosity as church membership and attendance rose, and Eisenhower encouraged the addition of “under God” to the Pledge of Allegiance and “In God We Trust” on the currency. 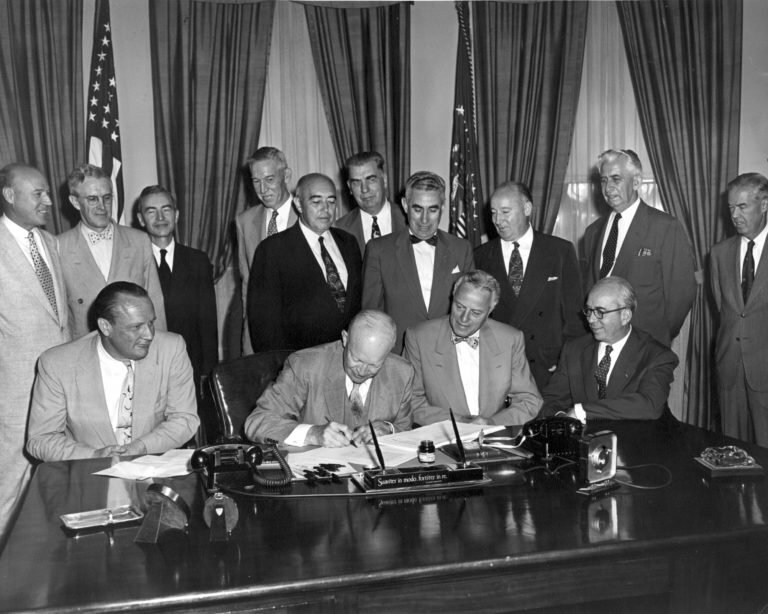 At the same time, Eisenhower left the New Deal intact and crucially extended it to incorporate African-Americans, even using federal forces to enforce the integration of Central High School in Little Rock, Arkansas.